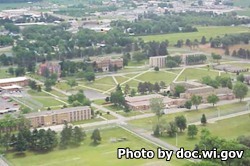 Praire du Chien Correctional Institution is a medium security prison that opened in 1997. This facility originally opened as a juvenile correctional institution for low risk non-violent males, and was later converted into a medium security prison that can house around 512 adult male inmates. Praire du Chien Correctional Institution offers vocational certification programs in microcomputers, bricklaying/masonry, forklift training, and building maintenance. Additionally, offenders can earn a High school equivalency diploma during their incarceration and receive alcohol and drug abuse treatment. Other programs provided to inmates includes a victim impact program, a cognitive intervention program, and parenting classes. Praire du Chien Correctional Institution also employs 144 inmates full time, and 69 inmates part time within the institution performing various daily duties which include laundry, food service, janitorial work, and maintenance. Weekly religious worship services are offered for several major religions, and the Chaplains office also runs several special religious based events. The health services unit at Praire du Chien Correctional institution oversees all medical, dental, and mental health treatment for the inmates, most of which can be performed on site. Visitation at Praire Du Chien Correctional Institution occurs on Tuesdays, Thursdays, and Fridays from 5pm-8:30pm and on Saturdays, Sundays and Holidays from 10:30am-5:30pm. For more information on visiting an inmate read the Praire du Chien Correctional Institution Visitors Guide here.